Amazon’s new blog publishing program has a major flaw: it lets anyone steal other people’s blogs and charge readers for them. 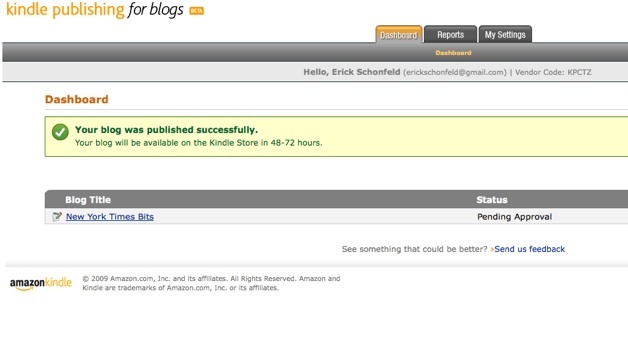 Yesterday, Amazon opened up the ability to publish a blog on the Kindle to anyone who sets up an account. Today, anyone can claim a blog even if it is not theirs, charge a subscription fee for it, and collect the proceeds. In fact, somebody already did just this with TechCrunch. If you search for “TechCrunch” in the Kindle store, the top result is our official blog for the Kindle, which you can subscribe to for $1.99 a month. Right under it is another official-looking TechCrunch blog, which in fact serves up our feed and also costs $1.99, but we don’t see a cent of that money. Not only does this enable me to get the revenue share for a blog I don’t write, I can also change the feed to post whatever I want to Kindle subscribers under the TechCrunch brand. 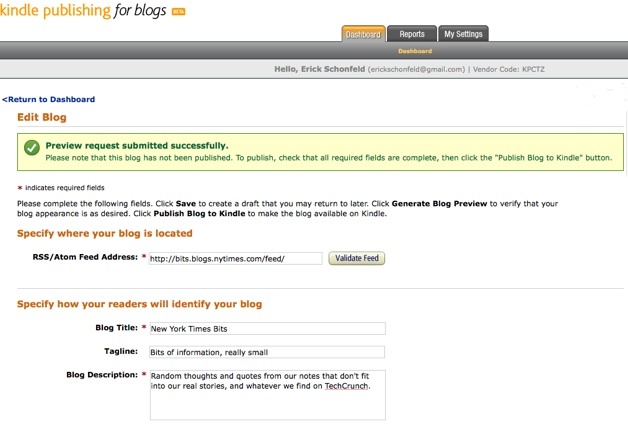 Not quite believing this could be so easy, I decided to create my own account on the Kindle Publishing for Blogs Beta and went through the process of claiming a blog I don’t own: the New York Times’ Bits blog. It was really easy. All I had to do was put in the URL for the Bits blog RSS feed, which Amazon “validated” as being a real feed. Then it asked me to enter a Blog title, tagline, description, screenshot, an image for the masthead on the Kindle itself, and search keywords that would return the blog as a result. Obviously, you can put whatever you want in these fields. I held back from uploading an inappropriate image, but did have a little fun with the tagline: (“Bits of information, really small”) and the description (“Random thoughts and quotes from our notes that don’t fit into our real stories, and whatever we find on TechCrunch”). 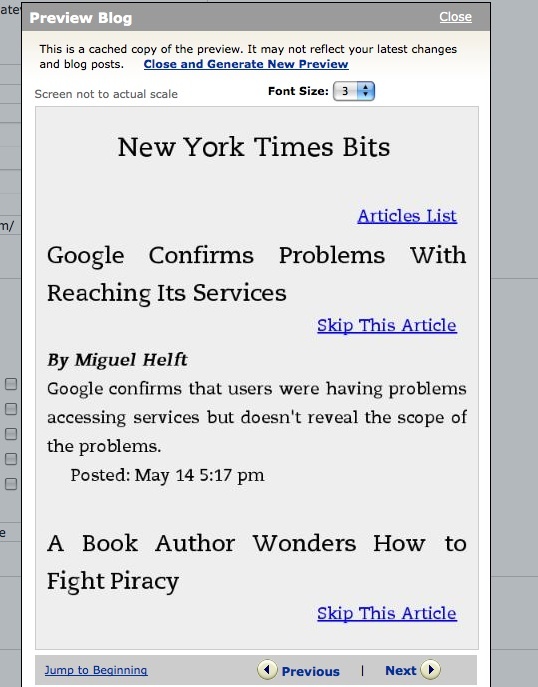 Now, if you search for “New York Times Bits” on the Kindle store, the version I created comes up as the first result and the official version comes up second. My tagline is there, and if you subscribe to my version 30 percent of your $1.99 subscription will be routed to my bank account. Don’t worry, though. I will donate all proceeds to a lunch-money fund for New York Times technology journalists (they’ve had their expense accounts cut back, you know). Or Amazon could just fix its blog claiming procedure. Update: Apparently, it is not just blogs that can be claimed. Uploading books is pretty easy too. Journalist Paul Carr emails us to say that he was able to upload his book, Bringing Nothing To The Party: Confessions Of A New Media Whore, to the Kindle Store ” in less than 24 hrs without even once being asked to prove that a) I was the author b) I had the electronic rights for the US.” Talk about opening the door to book piracy. Kindle Publishing for Blogs Beta is a powerful way for bloggers to publish their content to the Kindle community and we have streamlined the process to help rights holders launch their content as quickly as possible. Occasionally, people publish material to which they do not have rights, in violation of the Terms and Conditions for Kindle Publishing for Blogs. In these cases we react vigorously to remove unauthorized copyrighted material. The listing of a few unauthorized blogs was unfortunate and we have subsequently removed those titles.